Working for over 20 years as an award winning film editor and story consultant, Amos Ponger studied film science, cultural sciences, art history and multidisciplinary art sciences at The FU Berlin, Humboldt University Berlin and the Tel Aviv University. 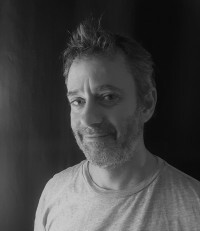 He has a Master’s degree from the Steve Tisch School of Film in the Tel Aviv University, worked as an editing teacher in two Israeli film academies, is senior advisor to our story development tool Beemgee.com, and recently co-founded the story consulting service Mrs Wulf. We all know that creating a great story is a process that can sometimes take many months and even years to fulfill. If you talk to professional writers they will probably tell you that they have complex relationships with these processes of writing. Involving dilemmas, fear and joy, suffering and excitement. And that these self-reflexive processes are also processes of self-exploration. Yet many writers, scriptwriters, filmmakers tend to put a lot of energy into their external ‏journey towards completing their story, focusing on drama, act structure, “cliff hanging”, while neglecting minding their own internal processes on their journey. What many film and story editors encounter while working with directors and writers is that authors and directors tend to have a very strong drive. They endure months in writing solitude, or filming in deserts, storms, war zones, perhaps even putting themselves in danger in order to realize their artistic vision. Yet at the same time very often they have a remarkable incapability of explaining WHY they HAVE to do it, and can only do so in very vague terms. You probably live in a society not well accustomed to minding internal processes. And if you write and tell stories, like most of us, you probably cling to the hope of the story’s success. You want people to laugh and cry, have profound experiences. You want the story to be technically perfect, and you want audiences to be mind blown. These external drives are great as they push creators to their limits. But creating stories, like any art, is an opportunity of going through the deeper layers of your own development. Great stories are not only about transformation. They are the outcome of profound processes of transformation. In the core of every human story and every work of art lie transformation and change, as well as the search for truth and enlightenment. As life’s journey comes to all of us without a user’s manual, humans have, probably since the creation of language, tried to create manuals for living, and stories have become one of the most efficient ways to encode and spread thought. By definition, then, telling a story is an altruistic act. While telling a story is an altruistic act, as an act of communication it has a storyteller who has an agenda and a perspective about the story, issues that have to be solved, wounds to be healed and questions to which she yearns to find answers. So even if you consider yourself to be a “fly on the wall” storyteller, you are actually one of your story’s characters. “Write yourself” as one of your story’s characters. It doesn’t matter at this point if you want to appear in your film or story yourself or not. Once you accept the fact that your own motivations, fears, wounds, unresolved issues, blockades, questions, fascinations and pains are part of the story, and part of the creation process, you can connect the dots of your own drive, your journey, the changes you go through, the emotions coming up, to the story’s theme, the plot, the journeys of your other characters, their unresolved issues, their decisions and their growth. And I am pretty sure that a profound process in the search for inner and outer truth will lead you not only to your own growth, but also to a great and honest story. Have you tried writing yourself as a character of your story? Go to the Beemgee tool, add yourself to your character overview, and click DEVELOP. See if you can answer the tough questions, for instance about what YOU want, what you NEED, and what change the story will bring about in YOU. Will this lead you to deeper insight about your story? We think so! Register or log in here. Amongst Amos’ works are award-winning feature length documentary films and documentary series such as “Bil’in my Love” (Director Shai Polack, Wolgin Prize, Special Mention Rotterdam Festival, Ch8 / TV5 / Duch TV), “FreeFlow” (Director Ramy Katz, Other Israel Award, Grand Prix Sarajevo), “Brown Babies – Germany’s Lost Children” (Director Michaela Kirst, RIAS Award, Arte / BR / WDR), “2 or 3 things I know about him” (Director Malte Ludin, Arte, Berlinale Panorama), “Mehubarim” (“Connected”, Israeli Television Academy Award), award winning video art films “Mother Economy” and “Counterlight” (Director Maya Zack).